I led and devised the Arduino and Sunday Lunch workshop – it was a lot of fun! Hosted at the Atrium Studios, Ipswich with a delicious lunch at the Brewery Tap. We covered all the Arduino basics and had some fun with servos and capacitive sensing. The code and exercises from the day are available here and the photos here. 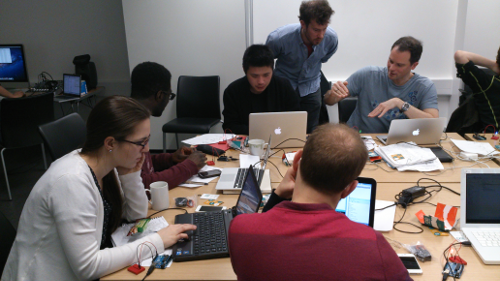 For Close and Remote’s Smart City Lab I ran an Arduino workshop focused on the Internet of Things at Deptford Lounge. We covered the Arduino basics, RFID reading and using the WiFi shield. All the examples are available here. Ten participants drawn mainly from Lewisham, and including artists; a poet; a marketing director and music entrepreneur; and a fraud examiner.